Now tightening your buckled girth is easier than ever. Safe, quick and easy for you and your horse! 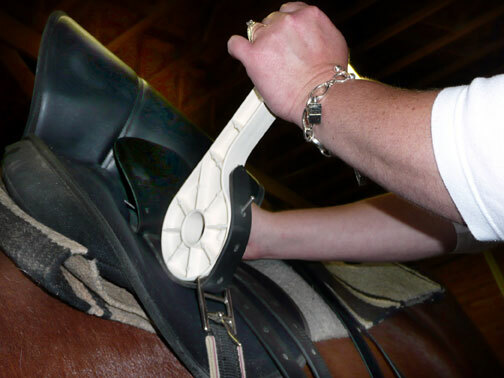 Simply thread the metal prong of the Cinch-Kwik through a hole in the girth strap and then roll the handle upwards until the strap is comfortably snug. Knowing that the tool can tighten up to 4 holes in the strap, be sure to give yourself enough room to tighten. NOTE: The Cinch- Kwik is extremely effective, so please be sure not to cinch the strap too tightly. Great for kids, novices, people with arthritis, tall or uncooperative horses!